Gym-Flex is an interlocking premium fitness flooring system perfectly suited to fitness suites and gyms with specialist biometric, plyometric or weight training areas. It is designed and engineered to maximise comfort, durability functionality and visual appearance. 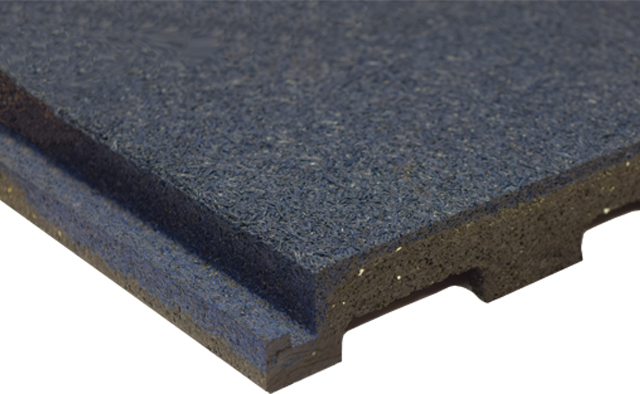 At 32mm thick, they provide superior sound insulation and shock absorption making them an ideal solution for those areas where sound reduction and floor protection is required, especially gym areas higher than the ground floor. The tiles also offer exceptional resilience in helping to prevent muscle and joint injuries. Gym-Flex tiles are constructed using 121 evenly distributed pedestals per tile, creating pockets of air space for a superior cushioning effect. The tiles are interlocking for quick installation with no use of adhesive, making them either a temporary or permanent solution. The tiles can also be installed over cabling and can be installed with ramps to provide access to disabled users and provide a neat finish. Gym-Flex ramps can be installed wherever the adjacent floor is lower than the mats, providing accessibility onto the surface for all participants, including wheelchairs. Ramps also enable the mats to be installed onto only a section of the floor instead of wall to wall coverage.